Note- I love my wife, but this one might seem a bit down on her. It’s not. She’s who I most often game with-either because she loves the games we play, or (more likely) it’s because I drag her into my insane adventures. Love you my dear. I’ve been thinking about the games I play most often. Once a month, I get a game of Pathfinder Society in as well as some Shadowrun and DCCRGP. But weekly, I get a game of DnD in as well as the Pathfinder Adventure Card Game. Why so much love for DnD and the Card Game? Well, I think it’s because of WHO I’m playing with as opposed to WHAT I’m playing. Most often around dinner, my wife and I will cook and then set up the Adventure Card Game. It’s fun, and it’s better than just staring at the TV while we eat. So, I play that game a ton. What I don’t play is the Shadowrun Crossfire game as much. It’s not a bad game, but my wife doesn’t like it as much. Since Jackson’s gaming scene is pretty small and I like my wife, I choose to play with her. So, no Crossfire on the weekly schedule. This also goes out to non-cooperative games as well. My wife hates games like Agricola. It’s far too much stress as you NEVER have enough time to do all the things that you want to do. I enjoy the frustration a bit, but she’s of the opinion that gaming shouldn’t be a stressful as life. Also, she hates games like Magic: the Gathering and Sentinels of the Multiverse. Both of those are games where you have to read a ton of information on small cards. She love games like 7 Wonders as they play quick, have good strategy, and don’t make you read a novel each time you play a card. I’m a pretty universal gamer, and I hope that the blog posts have shown you that. So, how do I do that AND play games with my wife? Well, I have to actively seek out other opportunities to game. Cons are a great way to find the random games to play. This is a great way to get new games to the table and to meet new gamers. Also, buying the equivalent of a board game a week can get expensive, so cons give me a chance to play a game and not have to buy that full thing! I also game online. OCTGN, Board Game Arena, Board Game Geek, Roll20, and Boiteajeux also give me a chance to try new games, meet new players. I don’t have to drive cross-country to play some new awesome games, and I get to see what else is out there. Bonus-all of these are free! Check them out if you get a chance. And, as a final way to get new games out there, I game at my local store once a week and twice a month at a local groups clubhouse. At these places I bring whatever games I want as I drag my friends into whatever strange Euro-card-dice-3D game hybrid I bought of some strange backwoods website. It’s a blast when you can meet the crazy gamers out there who will enjoy whatever is brought to the table. How about you? Who do you game with, how do they shape the way you game, and what do you do to play different games? Increase your Sorcery Points by 1 for every four character levels. Basics– Let’s get ready to roll! The Dungeon Master’s Guide is the final book of the core three for Dungeons and Dragons. This book covers all the behind the Dungeon Master’s screen aspects of the game. It is roughly broken into three sections: creating a world/universe, creating adventures, and the math of the game/how to run Dungeons and Dragons. You might be sleeply from some turkey, but your fighter can’t be! He/she needs to move double time! When spending superiority dice as a fighter, you may spend two in place of one. Basics-Fight the darkness! 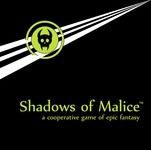 In Shadows of Malice, an ancient evil is stirring, and the players take the rolls of avatars of light trying to stop it. To do this, players must find the hidden strongholds of light among all the strongholds that have fallen to darkness before the vile Xulthûl. Each player starts with an item, soulshards, and a special power. Over a series of turns, the heroes move across the map revealing towns, mystics, monster lairs, and strongholds while shadow tries to find the strongholds of light. Each turn, players roll two six sided dice, one for movement and one for fate. If the player rolls doubles they draw a fate card. Fate cards range from great effects like doing extra damage to horrible effects like permanently getting a negative on all dice rolls. Fate cards last until they are spent or until a new fate card is drawn. The players can then spend movement points to move across the map. If player end on tokens or monster lairs on the map, they can encounter what’s there. In towns, you can spend soulshards to get items like potions or treasure. Mystics will heal or remove fate cards and make potions. Monster lairs and stronghold have monsters. When players encounter a monster, they roll to see the monsters type, the monsters power, and how many abilities the monster has. The type affects some powers and treasures, but provides flavor for the encounter. The power determines how much damage the creature does, how much the creature adds to its attack, and how much life the creature has. The abilities add new flavor to each combat like preventing damage or adding to the monsters attack. Combat is pretty simple. Both sides roll a six sided dice and add bonuses based on treasure, monster’s power and other cards. Before each roll, players can spend soulshards to activate abilities or to increase their dice rolls. Whatever side has the higher combat check does one damage to the other side. Some treasure, abilities, and powers allow monsters and character to possibly do extra damage depending on random dice rolls. Combat continues over these rounds until one side runs away or until someone dies. If the players win, they gain soulshards based on the powers available and have a 50/50 chance to gain clear soulshards on a one for one basis for each the monsters life points. If players travel together (forming a band), each character beyond the first player add an extra six sided die to the player’s combat roll. After the players turn, the shadows take a turn. Shadows randomly remove one seal from their realm each turn. Then, either spawn a new shadow or randomly move a shadow present on its own game board. If a shadow moves onto the spawn point, it gains life. However, if a shadow moves onto an open portal, the shadow moves to the player’s side. From now on, this shadow will move one to two spaces toward the closest stronghold. If the shadow gets to that stronghold, and the stronghold is a light stronghold, then the shadow becomes Xulthûl and fights the players. Players can fight shadows in the normal world to prevent this, or kill Xulthûl. Play repeats like above with players having a turn, then the shadows. The player’s goal is to find the hidden light strongholds among the shadow ones. For each light one found, the players gain power. However, for each shadow one found or uncovered by the shadows in the main world, the darkness gains power and all monsters are harder to fight. Once players find the one light stronghold per map tile, they win! How about helping the Superiority fighters a bit? You’ve spent a lot of time training. Increase your Fighter superiority dice to the next size. When you dice would normaly become a d12, they instead become 2d8. Basics-Can you stop Europe from burning? An ancient evil is being awoken by a small group trying to upset the tentative balance of Europe and bend a fiend to their will while the fate of the Concert of Europe rides in the balance. This book also provides GM with extremely detailed notes on the geopolitical standing of the Europe countries in 1856.